Polonyna Svydovets is the largest mountain pasture of all in the Ukrainian Carpathians. The Svydovets is part of the Polonyna Ridge, like nearly all of the ridges of the so called Outer Carpathians (called Beskidy/Beskydy in Poland/Slovakia) formed of the Carpathian flysch, which is mainly sandstone. According to most geographers, Svydovets belongs to the Eastern Carpathians, however, SP's Carpathians page splits the Eastern Carpathians in half and classifies all Ukrainian Carpathians as part of the Northeastern Carpathians. The massif of Svydovets, which constitutes a classic example of a polonyna (a local - i.e. only used in the NE Carpathians- word for a mountain pasture), sits just south of the uppermost section of the Black Tisa River, which rises on the northern slopes of the Svydovets and about 20 km away from its source takes a sharp turn south, thus forming the north and east boundaries of the mountains. On the west, the Svydovets Mountains are bounded by the Teresva River. The mountains extend between the town of Rakhiv in the southeast and the village of Ust Chorna in the northwest. Its main ridge, approx. 60 km long, runs east and then southeast, from Ust Chorna toward the highest peaks of the Chornohora. The Svydovets is characterized by an asymmetry between the north and south slopes. The massive, long lateral ridges of Apetska, Kobyletska and Kosivska, which have preserved traces of the old peneplain and run southerly, separated by broad valleys, don't bear traces of glaciation, whereas the north and northeastern slopes were gouged by Pleistocene glaciers, which results in the characteristic forms of relief, such as cirques and moraines. The western part of the massif displays relief typical of mid-altitude mountains, heavily affected by erosion within the water channels. The highest parts of the massif consist mostly of gentle slopes and ridges, and broad saddles. The glaciers formed the cliffs of Blyznytsa and the cirques around Unhariaska and Dohiaska mountains. Trufanets Fall is located on the right tributary of the Black Tisa (Chorna Tysa) river, by the main road leading to Yasinya. Its height is 36 meters and it is the biggest waterfall in Transcarpathia. The mountains, ideal grazing terrain, have been roamed by herds of countless oxen, cows, horses and flocks of sheep for at least several centuries. Consequently, there is no dwarf mountain pine to be found here at all. It's long gone owing to the slash and burn technique of expanding pastureland. Fortunately, patches of natural alpine meadows have survived in the highest and rockiest places. Only recently have the shepherds and their herds begun to disappear. These days the Svydovets hosts many more people in winter than it does in summer. Apart from the winter resorts, winter sports as well as ski touring are performed along the main ridge of the mountains. But avalanche risk is high here, and too many of the visitors are not concsious of the fact, so quite a few have been killed or injured by rushing snow, often set in motion by man. Blyznytsa 1 881 The highest peak, with a trig point on the top, resembles a grassy cone. The name translates (not literally) as kind of "Twin Peaks". Its north-east face includes three impressive cliffs, called the Gendarmes by the locals. On the rocky walls plenty of rare species of flowers grow. Velykyi Kotelor Heryshas'ka 1 770 The second highest summit,located in the central part (its name can be completely different, depending which of the languages is used: Velyky Kotel/Nagy Katlan (Hungarian) translates as Great Kettle/Cwm; the Polish name for the peak/polonyna is Tatulska. Legend has it that there were twins who fell in love with the same girl, and she said to them: “The one of you will become my husband who manages to bring me an edelweiss, a rare flower growing in the distant mountains. The brothers were advised by an old man to climb up until they reached an airy, rocky cliff where a solitary edelweiss flower grew. They parted and started to climb via different routes. Unfortunately, just as they touched the flower with their fingers, both at the same moment, the cliff split and fell apart burying both brothers. And since that time people have called this twin-peaked mountain Blyznytsa. The trailhead is at the bus station in Rakhiv, where you cross the bridge over the Tysa River, then turn right. Continue northwards along the national road. Occasionally some old marks can be spotted. After about 1 km, take a left turn. The route gradually ascends towards an old cemetery, past which an old road – paved ages ago – winds towards Terentin at 1388m, the first summit on the itinerary. There is a transmitter on the summit, which can serve as a major landmark. Especially early in the morning, when the visibility is excellent, you will enjoy the beautiful scenery. There are pleasant vistas towards the Chornohora and the Maramarosh Mountains beyond Rakhiv (most of the Maramarosh Mts lie in Romania). You pass a summit named Dovzhyna to descend to Perelisok Refuge, where you can have a rest and observe grazing sheep and horses. From there the route leads, gradually gaining altitude, to a mountain called Stara (Old - feminine gender), which affords a panoramic view of the main ridge of Polonyna Svydovets – in summer all covered with grass, in winter under the white coat of snow - with the massive southern slopes of Blyznytsa in the foreground. Down and up to Blyznytsa Pass, then turn left and after half an hour you’ll reach the highest summit of the Svydovets - the legendary Blyznytsa. Not far from the summits of Blyznytsa, some of the most interesting scenery can be found around Drahobratske (or "Ivor") Lake. It sits at 1600m near the north slope of Blyznytsa. Its length is 55 m, width 21 m, depth up to 1.2 m. The banks are formed by moraines. The lake feeds on ground water and atmospheric precipitation. The spot makes an ideal campground - a romantic night guaranteed - the tarn is surrounded by the sharp cliffs called the Gendarmes. Passing by Drahobrat ski resort you leave the territory designated a kind of nature reserve under the name of Svydovetskyi protected massif. Continue going north-west, traverse the summit of Stih (1707m, literally Haystack) and you'll be approaching the second highest mountain of Polonyna Svydovets called Velykyi Kotel, or more recently Heryshaska (1770m). Located outside the main crest, this summit marks the beginning of a giant spur running to the north-east. Its northern face is very steep. A spectacular panorama opens up, with both the highest mountain of Ukraine, Hoverla, and the highest mountain in Svydovets, Blyznytsa. The trail continues over the Apshynets Ridge, with some nice little lakes at its north foot at about 1490m. One of these lakes named Vorozheska is 4.5 meters deep and has an area of 0.7 hectares. The Apshynets Ridge is a favourable place for superb views of Blyznytsa and Dohiaska summits. Another hour’s walk and you descend south to another romantic spot. Dohiaska Lake is a conveniently located resting place, where hikers can pitch the tent and make a fire. Located inside a big cirque, which sits quite exceptionally south of the main ridge, Dohiaska Lake is the biggest tarn in the Svydovets, over one hectare in area, at an altitude of 1577 meters. It takes its name from the third highest mountain of Polonyna Svydovets: Dohiaska (1761 m), whose summit rises just SW of the lake. Having left the campground by Dohiaska Lake, the trail continues westwards where more lakes glitter in a cirque under Troiaska (1702m). Beyond Troiaska the ridge forks. The northern spur runs towards Tataruka (1707m). The main ridge continues west, passing by another impressive mountain called Unhariaska (1707m, literally Hungarian). Its northern steep face, once sculpted by glaciers, constitutes the headwaters of the Turbat River (turbat = wild, furious in Romanian), whose valley looks deserted these days. Beyond Unhariaska the trail turns southwest, past the peaks of Little and Great Kurtiaska (1644m). Another summit along the way is Keputa (1621m), after which you descend to the saddle. The last summit of Polonyna Svydovets for you to step on is Tempa (1634m) with its vast western slope prone to avalanches in winter. This part of the Carpathian Biosphere Reserve is located in the central section of the Svydovets mountains, at an altitude of 600 - 1881 m.a.s.l., with the total area of 6580 ha. The climate of the southern megaslopes of Svydovets is fairly humid, cool or moderately cold. According to the data from Kobyletska Poliana weather station (410 m.a.s.l. ), the average temperature of January is 3.4 degrees below zero, June - 18.4 degrees, the average annual temperature is 8 degrees Celsius. The annual amount of precipitation: 930 mm. The climate of the upland areas is cold, humid. The soil-climatic conditions of the massif's southern macroslope are optimal for the growth of beech, the formation of which has a climax character. The beech forests reach an altitude of 1380 m, which is the highest line of beech forest in the Ukrainian Carpathians. Various types of woodland is beech mixed with other trees. The beech-maple (Fageto-Aceretum pseudoplatanae) and beech-ash-maple (Fageto-Fraxineto-Aceretum) forests grow also on rugged, rocky ground. In their grassy floor the following species can be found:Phyllitis scolopendrium ,Lunaria rediviva , Helleborus purpurascens, Asplenium viride. The northern macroslopes offer very favourable conditions for the formation of mixed stands of trees. Thanks to the climate being colder, such tree species as fir and - near the upper tree line - spruce grow here. Above the forest zone, one enters an elfin woodland formed by Dushekia viridis and Juniperus sibirica. Clusters of virgin forests are the most precious assets of the Svydovetskyi protected massif. They cover an area of more than 3 000 hectares. In June 2007, these clusters together with other sites in Ukraine and Slovakia were inscribed into the UNESCO World Heritage List as the Primeval beech forests of the Carpathians. They rank among the most impressive chunks of wild woodland in the heart of Europe. To a botanist, the highest parts of the Svydovets, near the summits of Mala Blyznytsia (1872 m) and Velyka Blyznytsia (1881 m), are of great interest. Some rare alpine species, such as Bartsia alpina , Dryas octopetala, Diphasiastrum alpinum,Juncus castaneum , Lloydia serotina, Aster alpinus, Rhodiola rosea, Salix hastata are to be found here. Of all of the Ukrainian Carpathians it is only here that the following species occur: Drabba aizoides , Euphrasia salisbur-gensis, Saxifraga androsacea and others. Among other interesting and rare species are: Leonthopodium alpinum, Aquilegia nigricans, and Swertia alpina. The fauna of the massif is, generally speaking, typical of the Carpathian Mountains, though it is characterized by a smaller number of species which normally roam among the coniferous trees. The vegetation is mostly represented by moist beech phytocoenoses growing up to the altitude of 1380m a.sl., which makes for the highest beech forest line in the Ukrainian Carpathians. A sharp transition between the upper tree line and the meadow-clad ridges is a characteristic feature of the Svydovets. Today the total area above the tree line covers approximately 633 sq km. According to a recent study, a comparison of the tree line characteristics between 1852 and 2000 shows that the general area of polonyna decreased by about 1000 ha and the altitude of the tree line became higher by about 50 meters within the whole sample area. The closest airport is in Uzhorod. by the locals) from Uzhorod bus station run about every 2 hours, heading east (Tyachevo/Rakhiv/Yasinya). The closest airport is in Lviv. The closest International border-crossing point is in Kroscienko. The closest airport is in Budapest. , not far from the border checkpoint. Buses from Tyachevo to Krasna/Ust Chorna run three times a day. 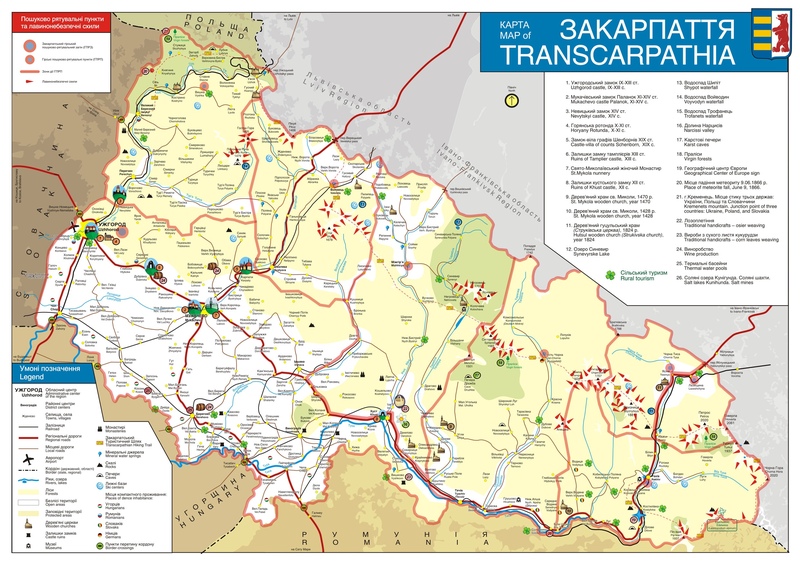 Approximate departures: 10:00 a.m., 12:00 a.m., 16:00 p.m.
- situated about 40 km north of Tyachevo (T0728 connecting road)in the valley of Teresva River. Svydovets is not a national park, so it means camping is allowed everywhere!!! The best campsites are Drahobratske tarn and Dohiaska lake located in the most picturesque central parts of Svydovets. The best known tourist resort in Transcarpathia called Drahobrat is the closest access point for the Svydovets. It is situated at the central part of Svydovets at 1 400 m of altitude, accessible by car from Yasinya. Last but not least, my thanks to yatsek who helped me with the layout of the page as well as the overview.